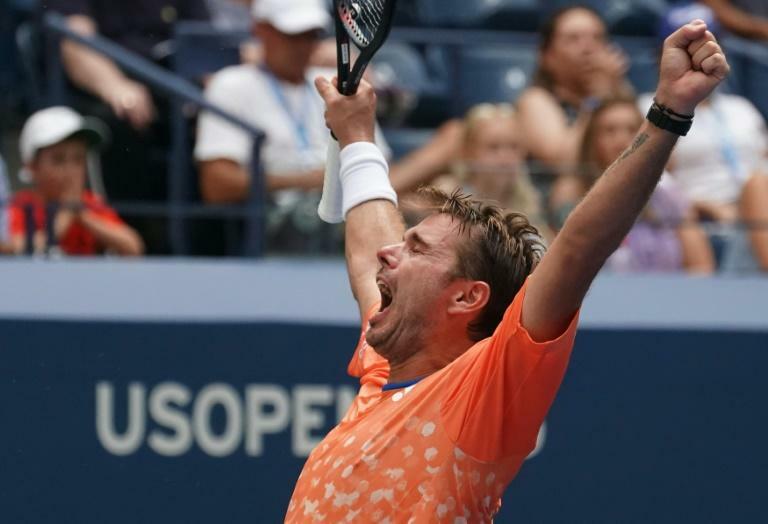 Former champion Stan Wawrinka battled past determined French qualifier Ugo Humbert Wednesday as world number one Rafael Nadal and others braced for another steamy day at the US Open. "I knew it would be a difficult match," said Wawrinka, who needed three hours and 21 minutes to prevail 7-6 (7/5), 4-6, 6-3, 7-5. "He's a young player. He qualified, he won his first match," added the 33-year-old, who served for the match at 5-4 in the fourth only to be broken by the 20-year-old. "I'm really happy with the victory," said Wawrinka, who faces Canadian Milos Raonic for a place in the last 16. Canada's Raonic, seeded 25th, defeated France's Gilles Simon 6-3, 6-4, 6-4. "It's never easy to play and move your best when conditions are so tough," said Wawrinka, who was irked to find a shortage of the ice-filled towels players are using to cool off during the changeovers. Once again on Wednesday, with temperatures hovering around 35 C, the US Open's extreme heat policy was in effect, allowing women a 10-minute heat break before a third set and men the same before a fourth set to give players a chance to cool down. "Appropriate medical timeouts for heat-related illness are allowed," a statement on the policy added. "Oh my God it was so tough to play outside there," said 15th-seeded Greek Stefanos Tsitsipas, who was toppled by Russian Daniil Medvedev. "I could feel it every single time I went to serve/return. I could feel all this heat coming into my face." He said the difficulty was mental as well as physical "because you don't have fresh air to breathe -- you breathe this heat that's coming, the moisture that's in the air. So you feel like you are empty." Use of the heat breaks -- a first for men at a Grand Slam -- didn't prevent six retirements on Tuesday -- five of them directly linked to the heat. Third-seeded Juan Martin del Potro, the 2009 champion, took on 72nd-ranked American Denis Kudla on the Louis Armstrong Stadium, while 2017 runner-up Kevin Anderson, seeded fifth, faced France's Jeremy Chardy on Court 17. Although Tsitsipas was feeling the heat, he didn't leave the court with Medvedev during the alotted break. "I had so many things that I had to do, so I actually forgot I had this 10-minute break when he left," he said.